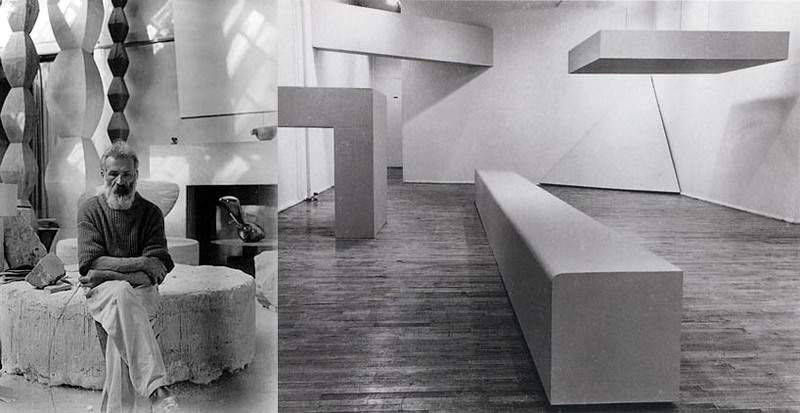 Imagine being introduced to the artist Robert Morris in 1964 and asking what medium he works with. He tells you plywood. Where would you be? You might ask how he uses it, and he might reply that he builds boxes. That is not to say that nothing is being asked and that the answers are meaningless to those asking. I used to be able to say that I worked with bronze - that was an answer that I could tell almost always impressed. Evidently it is the greenback of mediums. That reaction, the looks of approval and pleasure, are in stark contrast to the looks I get now. Polystyrene, plywood and paper, don't have the caché of bronze. Judging by the confused and crestfallen looks my current answers most often elicit, choosing to work in non-noble materials is, in most people's minds, akin to admitting banking in drachmas. But at least part of the problem lies with the question. Medium is as weirdly out of date for sculpture as the drachma is for banking. More often than not, when I tell people the kinds of materials I use now, there is an uncomfortable moment when I have to choose to race ahead and explain myself more fully or allow the conversation to awkwardly drift to another subject. In most people's minds bronze is the gold standard of sculpture; venerable, stable, trusted. It conjures an aura, not of originality or authenticity, but of authority. By uttering bronze, I was associating my work in their minds with images of kings on horseback, portrait busts of Burghers and Birds in Space. Thousands of years of men with beards in one syllable. Even coming from a destitute 22 year old living without running water at the end of a dirt road, it was clear people believe you mean business if you call out bronze as a medium; which is why I gave it casting it. Like a lot of other contemporary artists who think of themselves as sculptors, I no longer have a gold standard answer, because I don't want one. I no longer name-check a medium that instills knee-jerk faith in most people. Polystyrene (a person fave) is the sorts of medium that can mean a great deal within the context of a piece, a particular career, the broader artworld of installation art, performance, new media etc., and most importantly, in relation to the wider world of non-art. But unlike bronze which is valuable and storied, Polystyrene, in and of itself, is just cheap stuff. At least some of the misunderstanding lies with the introduction of "sculptor," which powerfully recalls a short period about 50 years ago when the 'disciplines' of painting and sculpture were clearly separated and their borders carefully policed by Modernist theoreticians. The modern role of the sculptor as we think of it, as an intellectual activity, is almost 500 years older than Modernism. The first sculptors emerged from the background noise of anonymousness in the earliest moment of modernization, the relatively recent period of the early Renaissance. In 1450 Filippo Brunelleschi, in contrast to the unrecognized craftsmen of medieval guilds, was celebrated in a biography as a creative individual and an intellectual. That biographical moment was a first, and an important first. 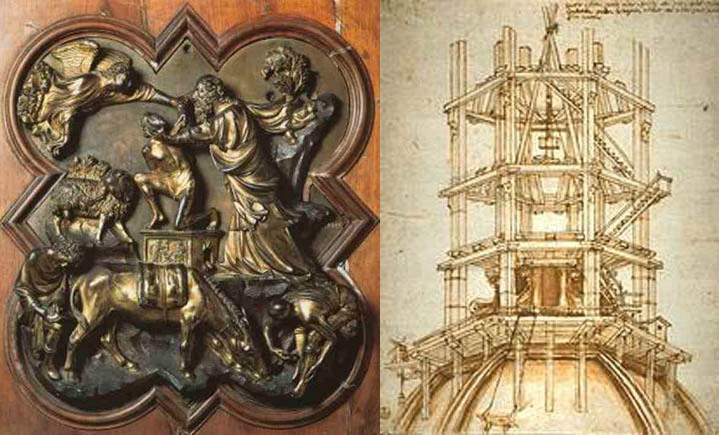 Brunelleschi was the first is a new class of artist-polyhistor. The "Renaissance men" garnered attention as individuals on merit of being artist-engineers and artist-scientists. The role of engineer and scientist has differentiated as those fields, and art it self, became more complex, sophisticated and specialized, which is why the artist has not lapsed back into anonymity, and has remained the subject of biographies. The next great intellectual watermark for artists as biographical entities came at the middle of the 19th century, as image production became increasingly mechanized, requiring less and less specialized technical knowledge on the part of artists, the artist-theorist emerged. Artists like the painter Gustave Courbet and Auguste Rodin began to think seriously about the nature of their work. The impulse to theorize flowered in the early Twentieth Century. As the revolutionary mass politics of Fascism and Communism, but also theosophy and psychology fired artistic imaginations. 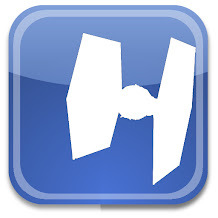 Again specialization has cleaved at this new role. Theorizing about art has become an increasingly specialized field of expert knowledge - but unlike the slow differentiation of engineering science amid early modernity, theory developed as a discipline at a time when there was a vogue for clearly defined disciplines and professions. Aesthetics leaved away from art history. Architects organized as never before. 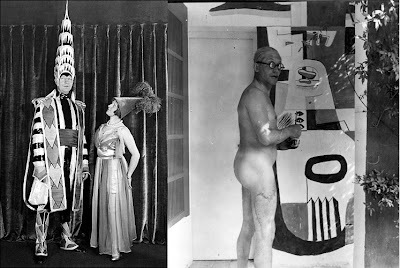 The manifestos of the early twentieth century artists were bombastic and admittedly naive - not the stuff of academic or professional acceptance. Modernist critical theory owes far more to the much cooler professional language of Modernist architectural manifestos, like those produced by the members of CAIM and the academic writings of Architecture historians like Sigfried Giedion. It should not be surprising then, that in order to differentiate themselves from the field of irresponsible and uncredentialed artist-polyhistorians, the first critical theorists begged, borrowed and stole from architecture. Because of that relationship, the job of Modernist artists were imagined as little more than a research arm of architecture. At first glance the arts might seem to have been in a situation like religion's. Having been denied by the Enlightenment all tasks they could take seriously, they looked as though they were going to be assimilated to entertainment pure and simple, and entertainment itself looked as though it were going to be assimilated, like religion, to therapy. The arts could save themselves from this leveling down only by demonstrating that the kind of experience they provided was valuable in its own right and not to be obtained from any other kind of activity... Kantian self-criticism, as it now turns out, has found its fullest expression in science rather than in philosophy, and when it began to be applied in art, the latter was brought closer in real spirit to scientific method than ever before... Scientific method alone asks, or might ask, that a situation be resolved in exactly the same terms as that in which it is presented. Greenberg presented the Kantian link between science and Modernist art as "historical fact," and himself as the messenger delivering the good news. But science is not a smooth progress of workmanly laboratory work. In his book, The Structure of Scientific Revolutions, Thomas Kuhn described the periodic "normal science," of research driven by a "universally recognized scientific achievement," a paradigm. But he is remembered for observing that paradigms have life cycles; that researchers stymied by problem that "ought to be solvable by known rules and procedures," or equipment that "fails to perform in the anticipated manner" reveal anomalies that cannot "be aligned with professional expectation." In these and other ways besides, normal science repeatedly goes astray. And when it does—when, that is, the profession can no longer evade anomalies that subvert the existing tradition of scientific practice—then begin the extraordinary investigations that lead the profession at last to a new set of commitments, a new basis for the practice of science. The extraordinary episodes in which that shift of professional commitments occurs are the ones known ... as scientific revolutions. They are the tradition-shattering complements to the tradition-bound activity of normal science.The crisis, or revolutions, have come to be called "paradigm shifts" and are the stuff of Postmodern wet dreams, but, for those interested in maintaining the status quo, they can also be thought of as dangerous and disruptive ideas. Like Courbet and Rodin, Constantin Brâncuşi was a sophisticated artist-theorist who's work reflects a thoughtful engagement with historical conventions of sculpture. 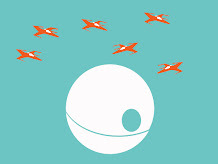 His work is loaded with "tradition-shattering" ideas. But rather than acknowledge Brâncuşi the polyhistor, Modernist theorists recast his work as "the tradition-bound activity of normal science," little more than a charismatic craftsman experimenting with variations of naked material possibility. Doing so Modernist sculptors were relegated to a research-branch of Modernist architecture. Sculpture studios became little more than laboratories idiosyncratically exploring "truth-to-material." Medium specificity was only central to understanding art for a brief period of the Twentieth Century - the period that coincides with the rise of critical theory. But because it was anachronistically imposed on earlier artistic production by the Modernists it became crucial for interpreting a good portion of the art produced during the modern period. In 1960 the critic-theorist Clement Greenberg defended and justified Modernist Painting as deserving of the same respect afforded earlier European masterpieces. This was done by tracing a historical narrative of aesthetic progress echoing the technical progress of architecture and science. Greenberg recast the surrealist action painting of the New York school as more advanced than, not only their European forebearers, but also their more highly esteemed peers in Paris. His essay was crucial to convincing American audiences, collectors, that "American Style" painting was more important than Pablo Picasso and other European modern masters who still dominated the markets and imaginations in the years just after WWII. He did so with serious, historically based reasoning and academic language. To make his case he stripped painting down to its atomic essentials, perspectival space and narrative were literary and theatrical elements that were not native to painting. "Enclosing shape" and "flatness" were, according to Greenberg, this Modernist discipline's home field advantage. It was by any measure a spectacular rhetorical success. Wealthy American collectors, who were crucial for supporting the Parisian artworld before the War, were swayed and began to collect art from artists who had been working in obscurity. The Museum of Modern Art began, for the first time to show New York artists, and Life Magazine and other popular American magazines began publishing exposes of American artists fingered by Greenberg and others. The sculpture of that period was, by any account, still the least theoretically developed, and therefor least important of the new American Modernist art. Geenberg had traced out a particular reasoning to justify the importance of American Painting, it was materialistic and, without his meaning it to be, it turned out to be radically reductivist. Greenberg insisted to his dying breath that his theories were never meant to be prescriptive, but in practice that is exactly what they were. It didn't take artists very long to decode the Greenberg formula - Frank Stella scored an early show at MoMA of concentric rectilinear black stripes on raw linen and curiously heavy wooden stretchers. This was flat painting that was all about the relationship between brush, paint, and stretcher. If Greenberg was the first great critic-theorist, Stella was the fist great artist-interpreter of the newly emerged critical theory. Greenberg's reaction to seeing his ideas materialized were telling. Stella, following Greenberg's direction, had turned the Modernist painting from a game of picture making into a game of object making. His reaction to the black paintings was ambivalent, he was outright opposed to what happened next. Stella's young studio mate was the sculptor Carle Andre who would go on to be one of the five canonical Minimalists - artists who's work was dismissed by Greenberg as "objects just nudgeable into art." His protege, Michael Fried, attacked the "objecthood" of the new work, And Andre's fellow Minimalist, the critic-theorist-artist, Donald Judd valorized it as "specific objects," and Morris as "objects" falling between the polarities of size range of the monument and the ornament: "useless three-dimensional things." The problem, for Greenberg and Fried who were protecting their role as theorists, and the opportunity, for artists like Judd and Morris who were reasserting their role as theorist, is that these "objects" required "reading" - and that required that artists once again be acknowledged as polyhistorians. None of this has anything to do with medium, but has everything to do with the people manipulating the material - the fight (and it was a fight) was over authority. Much is made about the art of the period as an example of the "death of the author" (often by the artists themselves). Confusion is inevitable for anyone looking back with any honesty on that supposed biographical rejection. The language used was obviously depersonalized ("objects"), but no group of artists has ever spoke more, or more forcefully that the Minimalist. Artists weren't rejecting their role as authors of meaning, they rejecting the denuded role of charismatic craftsmen of cartoonish doodads that they had been relegated to by the Modernists and reasserting their claim on the role as serious thinkers. That split, between looking at paintings as pictures, and looking at objects in the ways Greenberg had insisted Modernist Painting be looked at - as objects, is one of the most rehearsed moments in all of post-war American art theory. One of the most well know and widely accepted readings, is Hal Foster's, who points to that shift as the "crux" between Modernist and Postmodernist art. But there is a nagging problem with Foster's reading, very few, if anyone at all, think of sculptors working in the Minimalist tradition (in order of appearance) like Richard Serra, Mia Lin, Rachel Whiteread and Terra Donovan as Postmodern artists. Although there does seem some ongoing embarrassment about calling them sculptors, that is what they clearly are. Of all the real-time theories of Minimalist art, the one that has aged the best was articulated by the artist-theorist Robert Morris in a series of essays (that began as a satirical lampooning of Greenberg's academic style). 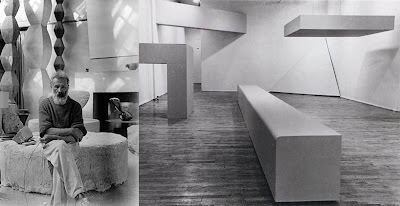 Morris', Notes on Sculpture, are clear, well reasoned explanations of Minimalist art written during the sixties. Besides being as well written and reasoned as Greenberg's theories, one reason they have aged well is Morris never abandon the title of sculptor. I studied with Morris, and he once asked one of my classmates "Am I Modern or Postmodern?" He may have been teasing my friend, but certainly his minimalist work and theories do not fit well within the category of Postmodernists art, that is typified by a rejection of all things Greenberg. Morris, like Greenberg kept an eye on history by way of George Kubler's useless things, and kept the door open for sculpture as an ongoing practice, not just a transitional crux. Had Greenberg been more consistent a proponent of purism in sculpture as he was in painting, he would have made a point of following a tendency in the history of modern sculpture towards the ‘essential conventions’ of the medium equivalent but opposite to that which he deemed prevalent in painting. He would then have closely watched the reduction of the sculptural practice to questions of matter, tactility, mass, and weight, which are ‘essential’ to sculpture as flatness is to painting. 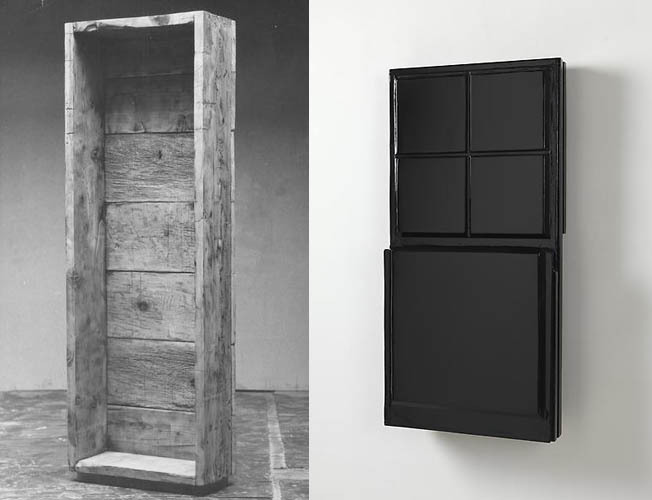 Had he done so, even skeptical as he was with regard to the kind of minimal art that had its origins in monochrome painting, it is probable that he would none the less enthusiastically have endorsed the art of Carle Andre or of Richard Serra. But he hasn’t. 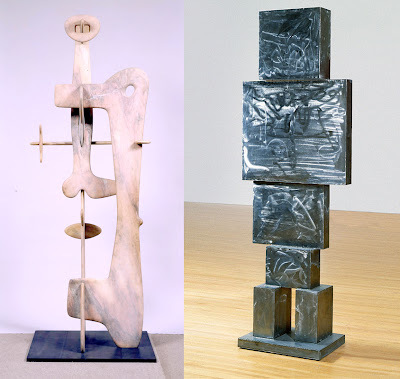 Consider the two of the sculptors Greenberg and his ilk did support and the mediums they are associated with, David Smith - fabricated brushed steel, and Isamu Noguchi - sheet stone. Had you met these guys at a party and asked what medium they worked with you would have asked exactly the right question. Both are strongly associated with the materials they used and the novel ways they managed to use them, Smith's ground steel surfaces, and Noguchi's slotted assemblage of stone slab. These men and an entire generation of sculptors they worked along side were not artist-theorists. Instead of concerning themselves with their place in the world they aped the "truth to materials" ethic of Modernist architects (Always loudly proclaimed, but very unevenly practiced), turning their studios into laboratories for producing proof of concept chotchskies. Leaving singular aesthetic judgment aside, the reason [Greenberg was not a consistent proponent of purism in sculpture] is probably that Greenberg has always been convinced that sculpture never had to fear its proximity painting in the way painting had, for its own survival, ‘to divest itself of everything it might share with sculpture.’ If sculpture had anything to fear, it would more likely have been its excessive proximity to architecture; that is why, according to him, the tradition of the monolith was driven to its ultimate conclusion by Brancussi after whom the best modernist sculpture (David Smith and Anthony Caro included), far from fencing off the pictorial, incorporated openness of form, textural effects, color, and, more generally the opticallity that characterized modernist painting. While de Duve gets close, he blames the victim. If Greenberg had anything to fear it was his own proximity to architecture. Had he been a more consistent proponent of purism in critical theory he would have acknowledged the importance of the artist as polyhistor. For de Duve to imagine that Richard Serra's is simply a "of matter, tactility, mass, and weight," is understandable but a failure of imagination. 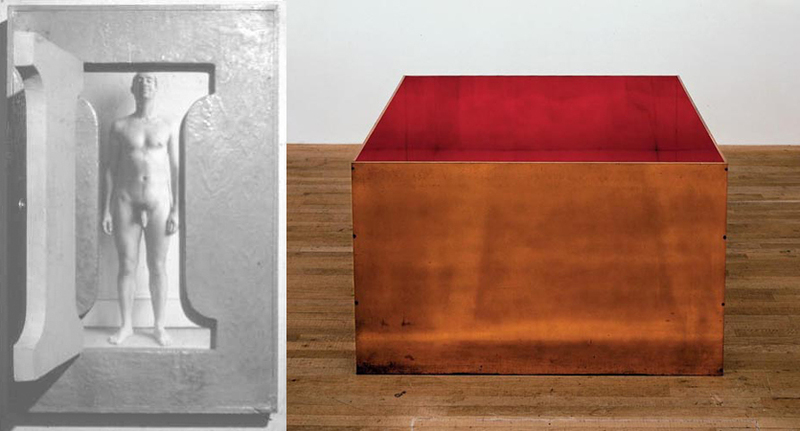 It doesn't explain the obvious relationship between Serra's work and artists like Robert Smithson and Tera Donovan. Its not incidental that Serra is using plate steel curved on rollers used to build battle ships and computer power developed to model Nuclear exposions and more that it is incidental that Donovan is uses disposable plastic cups and straws. These artists are theorizing by means of objects.